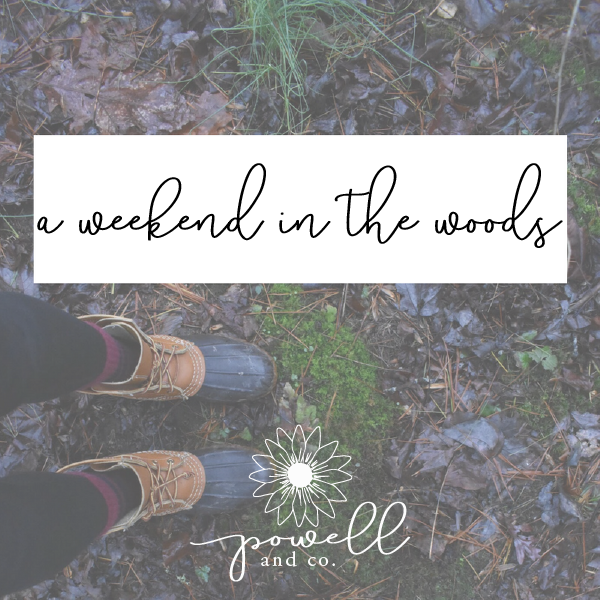 a weekend in the woods — Powell & Co. I had an incredible opportunity for a short getaway in the woods with the man I love the most this past weekend. It was a much-needed break from reality. We camped in the Cohutta Wilderness at Jacks River Fields campsite with a group of friends J has had since college. It may be because I was raised in a very secluded, rural area, but I always feel more at home and at ease when I'm in the woods. I tried living in the big city once. That lasted about six months! The traffic, people, cars, and lack of trees truly got to me. I'm settled in the suburbs now, which isn't completely ideal, but I get to take a scenic route to work and am still 10 minutes from a Target. I'll take it. I loved this trip because it only took us about three hours to drive to the campsite (through Friday rush hour traffic). I would suggest driving up there in the daytime if you can, as the fog on the mountain made the drive to the campsite very, very anxiety-inducing. Fortunately, my beau is a pretty fantastic driver and got us there safe & sound. I had ZERO cell reception at the campground. I was a little freaked out about it at first since I am quite the worrywart. Then, we discovered that we could get full LTE service about ten minutes down the road. It was the best of both worlds (and reassured my anxious soul)! As I mentioned earlier, it was cold and rainy for the majority of the trip. Not the most ideal camping weather, but we made it work! Tarps definitely help. Despite the downpours and wind, our men got a great fire going. I spent a lot of time warming up by it. There is something so calming about a nice fire in the cold. Two washes later and there is still a faint campfire smell in my hair, but I am certainly not complaining. Overall, it was an amazing trip and experience. I very much enjoy primitive living. It helps me connect more clearly with the universe and nature, unclutters my mind, and brings me such peace. Plus, can you really beat this kind of view? Do you enjoy camping? Where should we set up camp next? Let me know in the comments!